The idea of Yoga is to bring your mind, body, and spirit together in alignment combining your abilities with your best purpose and ultimately attain a greater enlightenment. When you practice Yoga you work to attain harmony with nature. This is the idea behind the Lenovo Yoga Pro 2 Tablet and one of the reasons I am so in love with it. When I was at CES (the Consumer Electronic Show) I had the chance to spend time with the team from Lenovo and learn about their line of Yoga and Flex laptops. They were explaining that the idea behind the Yoga was for the designers to think first about all the things you would love your tablet to do making it work in harmony with your life - instead of making your life work in harmony with your technology. On top of that it had to work in harmony with your budget. The Yoga Pro 2 achieved that! This tablet is seriously cool and works with you the way you want it to work. 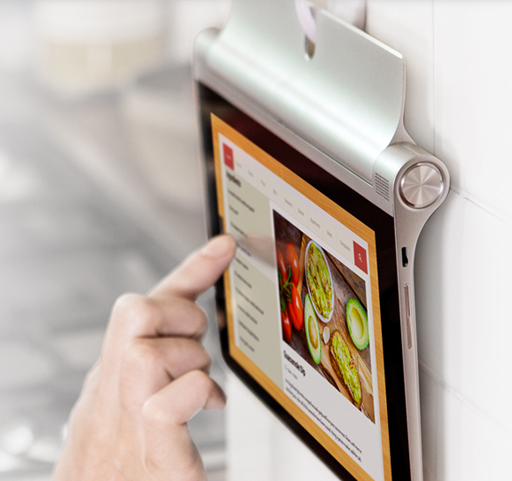 One of the greatest features is the back kickstand that folds flat when you want to just hold the tablet but then you can flip the kickstand open and use your tablet handsfree to read recipes or watch your favorite netflix movie while you are in the kitchen. Or lay it down the other way with the kickstand open and it will sit there on your desk at an angle that makes for easier reading so you can keep your body in alignment and not strain your neck to read text that is flat on your desk. But the coolest way you can use the kickstand is by folding it all the way flat and use the hole in the center of the kickstand to hang your tablet on any hook and continue to use your tablet from any place where you might need more counter space or where you have no counter space at all. This means to me that my technology will bend to my design instead of me bending to work with the way my technology does. I love this! Lenovo has also paid serious attention to the battery life of these little tablets and incorporated a battery that has an Epic Lifespan. On some models the battery life runs up to 18 hours which means you can go all day without plugging in. This is a fantastic feature for people on the go who may not be able to find a plug in when they need it most. I am thinking ahead to a wrestling tournament that is coming up where the wrestling parents and other supporters will be sitting on highschool bleachers from 9am into the evening. (These wrestling tournaments are wild). This is the same scenario for any parent who is supporting their kid at any district tournament. There are rarely plug ins found anywhere on the bleachers. This Yoga 2 Pro is perfect for them. During CES I had the chance to talk with a couple of the designers about the battery. This is important to me because we have two laptops at home that get hot and then the fan has to work overtime to cool it down and THEN the laptop gets loud. This is massively annoying and ultimately I end up just turning the laptop off altogether keeping me from getting done whatever it is I was working on. With this Lenovo battery technology there is no issue with heat and so you won't have that issue of a loud device that needs to be shutdown. All other features are cool but the battery is really the key thing for me. Another seriously cool feature that works with my life, instead of my life having to adapt to the technology, is a built in projector. This is an amazing feature for family travelers and for business travelers. When I travel with my family we bring an HDMI cable and when we get into our hotel room we hook our laptop up to the television with our cable to be able to watch our netflix movies or view the pictures from the day on the television. This can require some configuration and we have found a couple of hotel televisions that blocked this kind of access. I would love to be able to turn the lights out in the room and project my tablet up on to the wall of the hotel room and watch Frozen or some other movie that is saved on my VUDU account without having to mess with cables or having to figure out the configuration at each different vacation location. You could take a sheet outside and have a movie night in your backyard. How fun would that be? For business travelers you wouldn't have to worry about what technology was available when you reach your meeting destination. You also wouldn't need to lug around a bulky projector of your own. One of the greatest thing about the Lenovo Yoga? It works with your budget. They have devices that start as low as $229. This base model has all the basic options that any home use could need. Working with the idea that Lenovo wants the technology for you, there is a wide range of configurations within the Yoga brand taking you all the way up to a convertible thinkpad, with all the bells and whistles, for just over $1000. One of the things I have always hated about buying a new gadget is that feeling of not knowing exactly what I want when I walk into a big box store and then being confused by the teen age sales person who can make me feel like a dinosaur. Lenovo as this dialed in too. I visited their website Lenovo.com and they have a very easy chat box where you can chat online with one of their customer service agents and make sure you have all the features that you need ensuring you get the exact device that works for your life and your budget (without making you feel like a tech idiot). There is a Yoga 3 which compares to the Macbook pro - it is a lightweight dynamo that makes business travel amazing. Join the Travelingmom and Techlicious Twitter party to learn more about how we use our tech on the road and enter to win a great prize. Join us Thursday, January 22, for a special #TMOM Twitter party when we team up with our partners at Techlicious to chat about great travel tech, the joy and stress of working from the road and the cool tools that can help. Click HERE to Win!!! 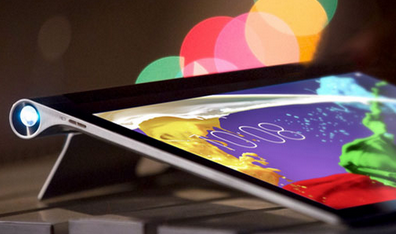 Win a Lenovo Yoga Tablet 2 Pro! 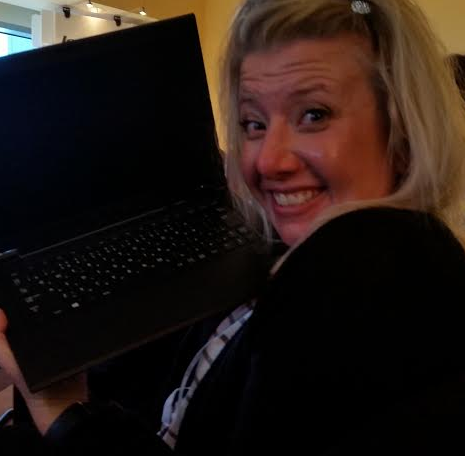 FULL DISCLOSURE: I was a guest at CES of Techlicious and was invited to lunch with the team from Lenovo previewing some of the latest technology - one laptop that was displayed was one of only three in existence and we were encouraged to not drop it. (Yeah - I didn't even touch it but it was pretty. I took a picture of my friend Amy holding this featherweight powerhouse instead). While lunch was fantastic it was not required to write about any particular product or even any of the products at all and all of my opinions and enthusiasm for the technology is my own. I was not given any product to test in exchange for this post. I just seriously love the idea that a company thought about my lifestyle first and then designed a product around that. I would love to win a tangerine Yoga 3 -- how perfect would it be for all my social media exploits? The built-in projection is brilliant!